American chestnut still sprouts from century-old roots, but blight destroys it before it flowers. Photo by John Ruter, University of Georgia, courtesy of Bugwood.org. Until recently, most American chestnut studies took place in labs or in orchards, as scientists focused on developing a blight-resistant hybrid that would grow like pure American chestnut. In fall of 2007, 2008, and 2009 Clark and her colleagues sowed thousands of chestnuts in a commercial tree nursery. In winter 2009, 2010, and 2011 the trees were planted in three national forests in the southern Appalachians. The study was designed to test how chestnut breeding type and seedling size affected survival, growth, and susceptibility to blight. The scientists also tested the effect of genetic family. A portion of this research was recently published in the journal New Forests. Clark and her colleagues also planted pure American chestnut seedlings. American chestnut is extremely sensitive to the exotic diseases that cause chestnut blight and root rot, and the pure American chestnut on the study sites will most likely die before they flower. Chestnut that is theoretically blight resistant has only recently become available for testing, and Clark and her colleagues planted hybrid seedlings developed by The American Chestnut Foundation. The seedlings theoretically inherit 94 percent of their genes from American chestnut and 6 percent – which will hopefully help them live through the blight – from Chinese chestnut. The hybrid is from the third backcross generation and is known as BC3F3. The BC3F3 seedlings tended to be just slightly smaller than pure American chestnut. 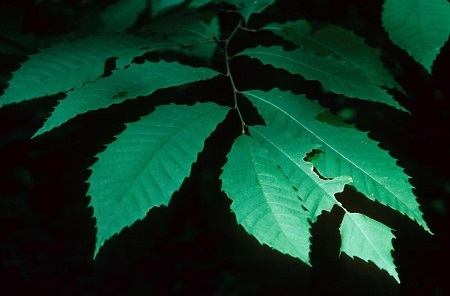 Apart from that – and their resistance to blight – the BC3F3 seedlings were more similar to pure American chestnut than Chinese chestnut. Chestnut blight affected the BC3F3 seedlings and Chinese chestnut seedlings at about the same rate, while the pure American chestnut was very sensitive to the disease. Clark and her colleagues will continue monitoring the BC3F3 seedlings to determine whether the resistance is stable or whether it will change over time. Before planting, the scientists sorted all the seedlings by focusing on the size of their root collar. Because some nurseries sort seedlings by size, determining whether this affects chestnut growth and survival could be critical to future restoration efforts. “We found that seedling size at planting affected the plant’s growth over the next few years,” says Clark. “Larger seedlings had more stem dieback and slightly lower survival.” However, the larger seedlings maintained their size advantages over time compared to the smaller seedlings. The study is ongoing, and will eventually provide insight into which nursery practices and silvicultural techniques work best for growing blight-resistant seedlings in the wild. For more information, email Stacy Clark at stacyclark@fs.fed.us. « Older Previous post: How Sustainable are Eucalyptus Plantations?